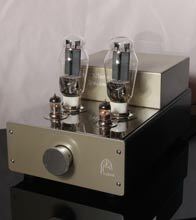 The new Silver Night Special Edition 300B power amplifier. Internally known as the Silver Night IV, which isn't quite correct as this is the 6th incarnation of this legendary amp. Featuring the same military grade aluminium uni-chassis , the Silver Night Special Edition gets a new, cleaner look, with highlight features designed by the commercial designer Marko Schregardus. The new design features a badge less top transformer cover, with just the name engraved on the front. A new mirror finished top plate without screws, which the old panels had and a new fillet piece that both highlights and accentuates the valves, giving an organic feel as if the valves are "growing" out of the amp. The front panel too hasn't been neglected. The front panel and top box are in a champagne gold colour, with a more tactile knob, designed to enhance both the overall look and to be easier to the touch. On previous models, just our logo was engraved onto the front panel, we have now included our name. You will also notice the cleaner smoother lines on the front panel and top plates and the seamless transition from the mirror polished top plate to the transformer housing. The top aluminium top box houses the newly designed mains power transformer and HT power supply, separating AC in the top to DC in the main body. Looking inside you will see quite a few changes from our Anniversary amplifiers. By keeping our wiring neat and flowing and at different levels we keep hum and noise to an absolute minimum . For example our valve heater wires run very close to the chassis, whereas HT wires and signal wires run in free air, and if they have to cross, do so at 90 degrees to each other. Solid silver signal wires on this amp run inside teflon tubing and Red "Power Tubes ®"
We have wired the signal path in pure silver, you will see on the picture to the right that we are using 5*9's Audion Blue Silver interconnect to an Alps blue Velvet pot. In fact the entire audio path is run in silver. We now use the world renowed WBT nexgen loudspeaker binding posts. We have found these to give a much better sonic signature and improve both the top and bottom end. Going a step further in the design process, gave us an idea of how to improve our already very good output transformers. These are made in house, using a very high purity copper conductor, M6 grade silicon steel and a slightly different dielectric internal substrate giving an extremely high bandwidth (typically <10Hz to >30Khz). Normal transformers are designed for 20Hz - 20Khz. All our output transformers are built and tested to extremely high standards. They are even HiPot tested to 5KV. To the right you will see more of our "Red Power Tubes®" housing solid silver audio wiring. The new transformers were designed specifically for the 300B valve. Knowing where the strengths and the weaknesses of the valve lay, enabled us to tailor the output transformer to excel against others. The overall look, feel and of course sound truly are a Special Edition. Well primarily on first switch on, the characteristics of the 300B shine through. However within 15 minutes or less when the valves have warmed up, they bloom. The bass really is exceptionally well defined and detailed, the blacks in a musical passage really are black and not an inky grey that some systems will give you, Mids are accurate and forward and certainly revealing and the highs show detail that needs to be heard to be appreciated. Overall the sound is clear, detailed and controlled without being fatiguing. The look of the new amp is subtle and the finished detail is cleaner and more stylised. 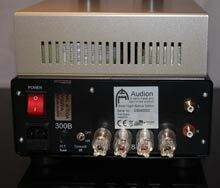 The amp gives about 9.5 watts of pure class A output, but being conservative we say only 8 watts as that is the lowest power it will give with countries that only have a 100V mains power supply. It is ideally matched to loudspeakers of over 89db efficiency, but will drive slightly lower efficiency loudspeakers to moderate sound levels (spl) in a small to average listening room <30m² rooms. The Silver Night Special Edition really is an easy amp to get along with. the JJ 300B valves have a life of 2000 plus hours as the manufacturers claim but we have found them to have many more (5000 hours and more) our smaller NOS (new old stock) Russian 6H23N valves are good for 10000 hours and more. The special edition is now also available as an integrated version and a Parallel Single Ended version as well as a matching Line/MM Phono, silver wired pre amplifier with choke and active power supplies.